No, it wasn't a holiday for anyone else, just a long awaited visit by Paul which gave everything a festive air. And the sun came out again, which is always welcome. 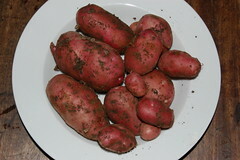 We didn't get all that much done, too busy having fun but we did have a huge celebration dinner that you can read about here and took a first harvest from the potato patch. These are the results. The whites are a variety called Swift, a recommended first early and the reds; Stroma, usually described as a second early but we've found it just as fast as Swift. Each bowl represents the crop from two plants, tiny amounts perhaps but the seed tubers were only planted about eight weeks ago. 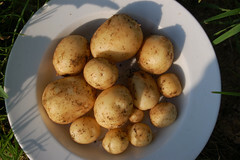 We will harvest them successionally which will allow the later plants to bulk up but there is no point in leaving earlies in the ground too long, their value is in their speed to commence the new potato season. The later varieties are also growing well, the Ambo is in flower and the Ratte and Winston have made strong plants. We did find one diseased plant of Ratte which has been removed and as a precaution we have sprayed with Bordeaux mixture, still just allowable as an organic remedy, to discourage blight and mildew. 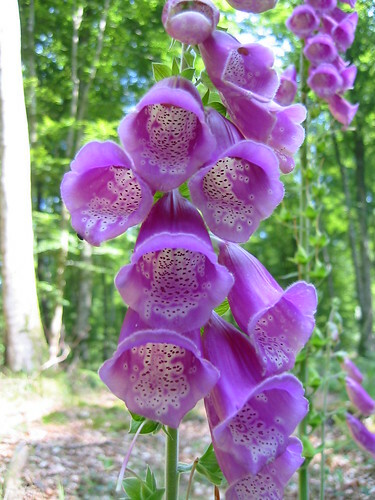 That still left time for a walk in the forest, where that beautiful foxglove and its friends were in full bloom. Lovely foxglove pic. Why are they called that? I'll have to look it up.